This is always one of my go-to recipes and can be finished while the baby is down for a nap! 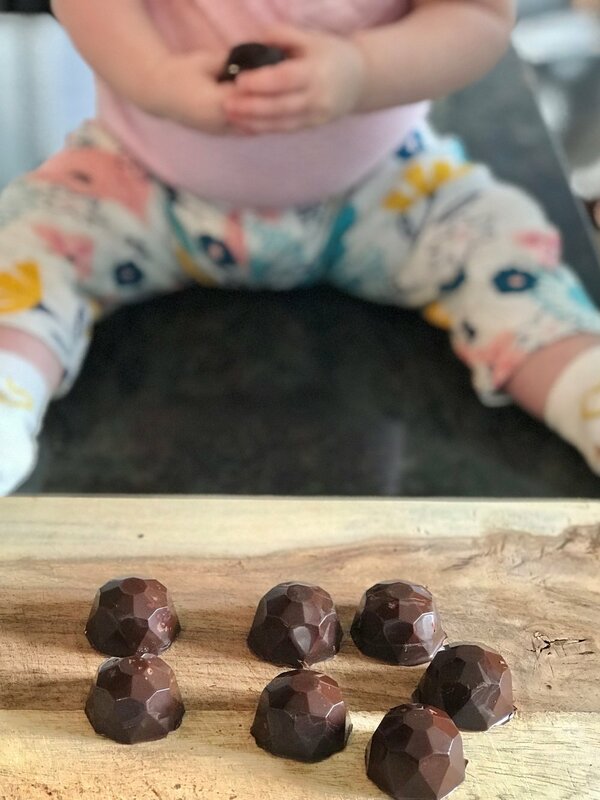 I make them in little chocolate molds because it makes them look like they take way more effort than they actually do! In a small bowl or measuring cup, heat 2 ounces of the chocolate in the microwave in 15-second increments (to prevent burning), until melted—a little over 1 minute total. Pour 1 teaspoon of melted chocolate into each well of the chocolate mold, then flip the mold upside-down onto a cooling rack placed on parchment paper. Let the excess chocolate drip off onto the parchment paper, so that each well is lined with chocolate, rather than filled with it. Turn the mold right-side-up again and place it in the freezer for 2 minutes to set. In a separate bowl, make the truffle filling by melting the remaining 3 ounces of chocolate along with the heavy cream (using the same method to melt as you did in Step 1). Once the chocolate and cream are melted, gently fold in the bourbon. Scoop the filling into the chocolate already set in the molds, leaving enough room to pour more plain chocolate on top. Place the mold back in the freezer for another 3 minutes to set. Once the chocolate fillings are set, pour a small amount of the plain chocolate on top of each one to seal everything in. Place the truffles back in the freezer to set for a final 5 minutes. Then pull the truffles out, flip over the mold, and press the truffles out. Enjoy!